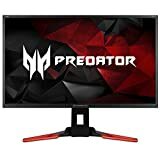 The Acer Predator series is a very popular one in the world of gaming monitors, and one of the most acclaimed product in this series is the Acer Predator XB321HK UHD monitor. In terms of specs, it is one of the most powerful gaming monitors on the market. With its 32-inch display, the monitor promises a fulfilling and satiating experience even for the most avid of gamers. Combined with Nvidia’s G-Sync technology, the Acer Predator XB321HK is one of the very best gaming monitors out there. The Acer Predator series takes pride in offering an uncompromised gaming experience, and that is also the case with the Predator XB321HK monitor, which offers 32 inches of UHD display with a resolution of up to 3840×2160. With such a high resolution and screen size, you can expect your gaming experience to be turbocharged into unchartered territory. The UHD display is combined with Nvidia’s G-Sync technology to deliver a gaming experience void of screen tearing or input lag. The UHD gaming monitor also features an IPS panel, which delivers accurate color rendering, sharp and crisp images, and smooth textures. The display monitor features a 16:9 aspect ratio and a 0.185mm pixel pitch for the complete widescreen experience. The combination of these specs delivers an immersive world of action with all the details and without any blind spots. With the Nvidia G-Sync technology, the monitor synchronizes the monitor’s refresh rate with your powerful Nvidia GPU to minimize issues such as input lag and display stutter and to eliminate screen tearing. Thanks to this combination of Nvidia and Acer’s best technologies, your gaming experience will never be the same again. The monitor features a unique stand design with red-colored stand legs and a very slim body. The stand is very sturdy and stable despite featuring narrow bezels. The screen thickness is also on the low side, and the end-product is a stylish and reliable monitor. The monitor is designed with the best ergonomics as well as built-in eye protection so that you can keep playing your games and fighting your battles without any fatigue. The monitor also features two built-in speakers to deliver a fulfilling and immersive gaming experience. It only offers 2 display input ports, 1 DisplayPort, and 1 HDMI input, while there are also three USB 3.0 ports. The monitor is designed to handle data transfers at high rates, which is why both the DisplayPort and HDMI port are high-bandwidth connection ports. You can use the USB ports to connect your keyboard, mouse, gaming headset or mobile device to the monitor directly for charging or other purposes. Smooth gaming action and lag-free performance without any stuttering, ghosting or screen tearing. Ultra-HD monitor with very high resolution and widescreen display. Built-in speakers and compatible with Nvidia’s G-Sync technology. Only two display input options. Lacks headphone in/audio out port. Overall, the Acer Predator series is one of the best series in the world of gaming monitors, and that also stands true for the XB321HK.